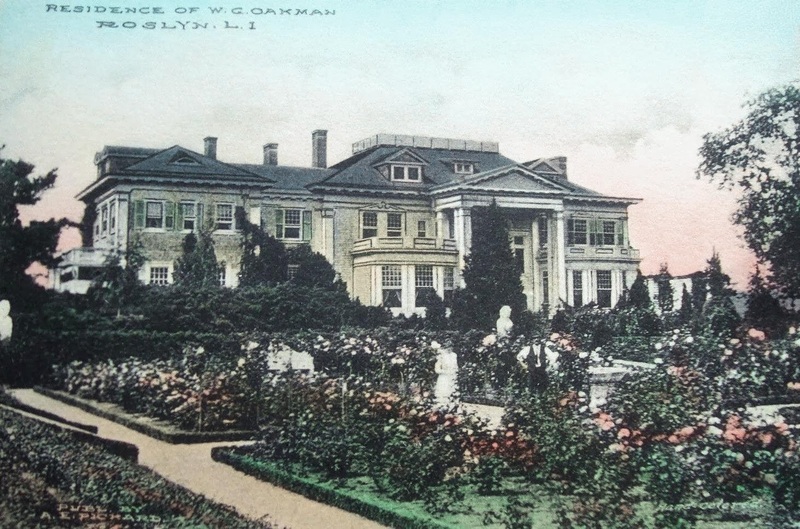 'Waldene', the Walter G. Oakman estate designed by Grosvenor Atterbury c. 1900 in Roslyn. 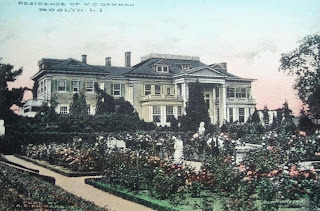 Click HERE to see a brochure from when the estate was for sale and HERE for more. 'Waldene' has since been demolished. With what are probably Mr. & Mrs. Oakman taking a stroll in their garden, this picture needs a caption – Ancient? I know this is not the style for which Grosvenor Atterbury is famous, but I think 'Waldene' is a good looking house, inside & out. At some point before the sale brochure was printed the widow’s walk was removed – I bet the view was great. Good catch...I didn't even notice the people the first time I looked at it. The view overlooking the village of Roslyn and the water with Harbor Hill rising over the treetops across the way had to be great indeed.